A view of the Trestle above I-70, just north of downtown St. Louis. 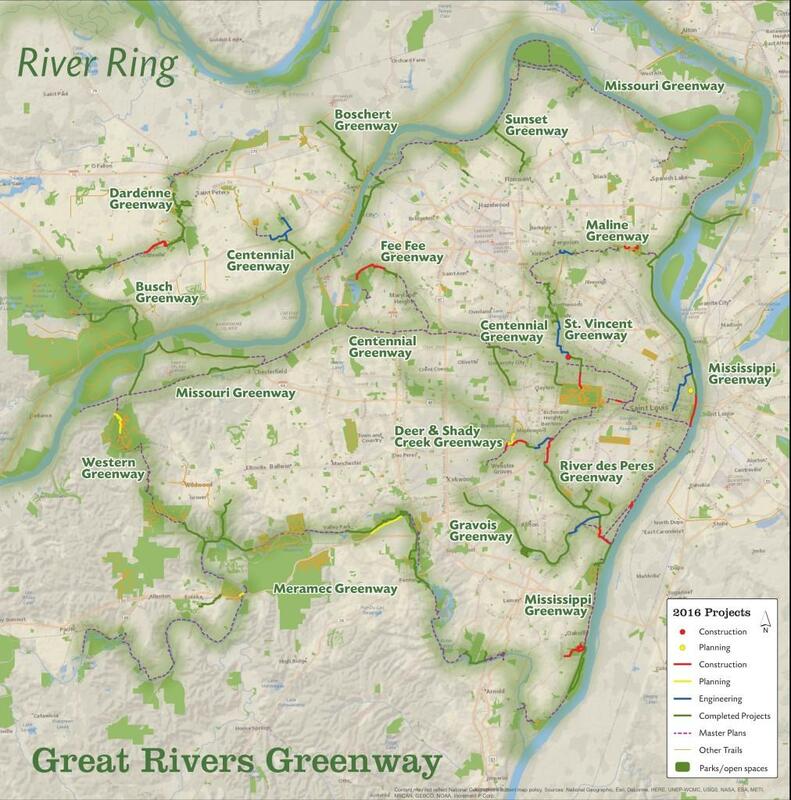 On Tuesday’s St. Louis on the Air, we heard from Seth Treptow, communications manager at Great Rivers Greenway, about the history and future of the project. We also heard about what other developments Great Rivers Greenway has up its sleeve coming in 2017. Have a question you want to ask Curious Louis? Ask it here. What's going on with "The Trestle?" It's a project that's been in the works from Great Rivers Greenway on the north side of St. Louis but, mysteriously, development has stopped on the project. GRG's communications manager, Seth Treptow, joined the program to discuss the project. So, where is ‘The Trestle’ anyway? The Trestle is a proposed project from Great Rivers Greenway that would take the old an old, elevated train trestle on the north side of St. Louis and repurpose it to serve as an outdoor attraction and bicycle and pedestrian byway. The proposed path begins in the Old North neighborhood, near the I-70 overpass at exit 249B. It used to be a stretch of elevated train track that served as a path for an electric commuter train that ran between Illinois and downtown St. Louis. It was known as the “Iron Horse Trestle” and the commuter train ran until 1958. The proposed path continues for 1.5 miles from the overpass until it juts up against the McKinley Bridge Bikeway and the Riverfront Trail. Right now, The Trestle is inaccessible and not prepared for bicycle or pedestrian use. Great Rivers Greenway purchased the land from the Illinois Terminal Railroad in 2005 at the price of $1.5 million. The rail was built about 100 years ago. The project is one that Great Rivers Greenway still wants to tackle, said Treptow, envisioning the space as similar to something like the High Line in New York City. But a lack of funding for the project has brought development to a halt. The completion cost is $60 million. In the search for that funding, however, there wasn’t much available. However, Treptow said there has been renewed interest in the project now that another big development on the north side has been given the greenlight: The National Geospatial Intelligence Agency. If the project could be completed, what would it be like? Treptow said that the elevated, linear nature of The Trestle would make it one of a handful of such sites around the country. Other examples include the High Line in New York City, the 606 in Chicago and the Atlanta Beltline. The Trestle would include a walking and biking path, of course, but it would also include green spaces, plants and gardens. Eventually, the hope would be to include an event space to hold concerts and activities. “It would essentially be a garden in the sky,” Treptow said. Why would it be so expensive to update? While the infrastructure of The Trestle is sound for a train, there are different requirements that would have to be in place in order for The Trestle to bear an active load of people, plants and vegetation. There would also have to be amenity changes, such as bathrooms. Likewise, Great Rivers Greenway places a high value on keeping its trails successful and ADA compliant. Seth Treptow, Communications Manager, Great Rivers Greenway. “This all adds up for that large of a stretch,” Treptow said. Treptow said that it would not be cost efficient to simply make the Trestle into a bike path without other amenities because one of the greatest costs to such a project is mobilization and the shutting down of highways to do construction work. Great Rivers Greenway was only able to paint The Trestle overpass its bright green color when I-70 was shut down while building the Stan Musial Veterans Memorial Bridge. How does the incomplete nature of The Trestle impact the rest of the trails in the Great Rivers Greenway system? If completed, The Trestle would add miles to the system by connecting with the Riverfront Trail and McKinley Bridge, but there would need to be other paths forged to connect the trail to downtown St. Louis. Treptow said that the organization gets quite a few inquiries about The Trestle and that it is one of the most common questions Great Rivers Greenway is asked about. Recently, Great Rivers Greenway started the Great Rivers Greenway Foundation in order to pursue private dollars from corporations and individual donors in order to fund projects outside of their purview as a taxpayer-based organization. Treptow hopes the foundation will be able to pursue public-private funding to continue work on The Trestle. Great Rivers Greenway is pursuing many other projects in the St. Louis region during 2017. Right now, the organization is working on 16 different greenways with 54 specific projects inside those greenways. The Chouteau Greenway: A quarter-mile stretch of path that runs through Cortex. After it is completed, the hope is to use this off-street path to connect Forest Park with downtown St. Louis. While those projects are underway, there are still 113 other miles of usable greenway from the project. There are about 2 million trips on those greenways each year. You can find more information on Great Rivers Greenway’s website here. The 2016 Great Rivers Greenway project map.